Big Sky Basketball: How Good Can Gabe Rogers Be? After the graduation of Cameron Jones, someone is going to need to step up and be the leaders for the Lumberjacks next season. The frontcourt is lacking in established players and star talent, which could a lot of pressure on the backcourt. 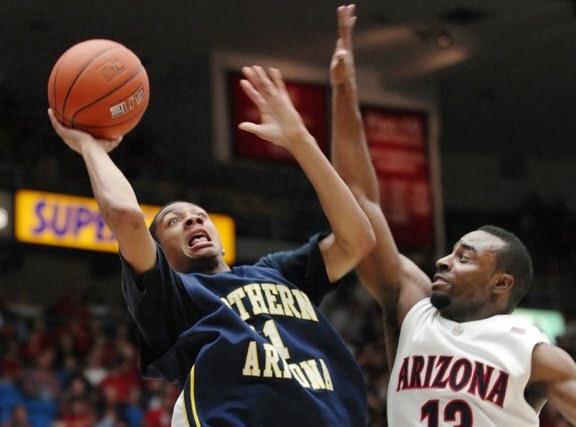 Fortunately, NAU has a very talented player back there in Gabe Rogers, who could be a star entering his junior season. Rogers was second team All-Conference last season, so he is no stranger to success. But this year, there will be no Cameron Jones to draw the attention of defenses. First and foremost, Rogers is an elite shooter from the outside. He shot 46.8% from 3-point range last season, draining 81 of them. Because of this, he posted solid EFG& and ORtg, though not quite as good as you would expect for someone with that high of an outside percentage. The reason is that he only shot 40.1% from 2-point range, which is a very mediocre mark. It is not really an aberration either, because he was at 41.2% his freshman year. An improvement to even a modest 45% would do wonders for his offensive efficiency. Rogers takes good care of the basketball, posting a pretty solid 15.9% TO Rate, even with using 21.6% of their possessions. However, his Assist rate was also pretty average, at 16.1%. If he is going to be the leader, he has to become a better distributor. While he will be off the ball a bit with Stallon Saldivar in town, he needs to create shots for his teammates more often. One more improvement would be if he can get to the FT line a little bit more. He is a very good FT shooter, and so some increased attempts would be a nice boost for his scoring and efficiency. Cameron Jones used 37.6% of NAU's possessions last year, second most of anyone in the NCAA. That is a lot of shots and possessions to make up. Gabe Rogers was second on the team in those areas last season, and even more of the load will fall onto his shoulders this year. If he can improve inside the arc, maintain his great outside shooting, and find a way to get teammates a few more open looks, he could definitely be a member of the First Team All-Conference at the end of 2012. Gabe Rogers has the potential to be one of, if not the, best three point shooter ever at a college known for quality outside gunners.